Rose Breasted Grosbeaks are stocky, medium-sized ( 7 - 8 1/2" ) songbirds with large triangular bills. 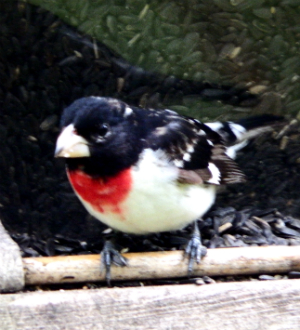 Adult males are mostly black-and-white birds with a bright red breast plate from their throat to the middle of their chest. Females and immature birds are brown streaked with a white stripe over each eye. These birds eat seeds, fruit, and insects, depending on the season. During the mating season they eat half insects and half seeds and fruit. During migration they eat mostly fruits. Insects will include beetles, bees, ants, bugs, and butterfly larvae. They are very fond of wild berries and weed seeds, but may also feed on farm crops like corn, peas, oats and wheat. Considered monogamous, both male and female participate in building the nest... a cup-shape nest built usually in a tree 5 to 25 feet high using very small twigs or weeds. Females lay 3 - 5 blue green eggs with brown markings. Eggs are incubated 13 to 14 days by both the male and female. The male will take turns setting on the eggs during the day, but the female sits on the eggs all night. Both the male and the female will sing softly to one another as they change places on the nest during the day. Young birds fledge in 9 to 12 days after hatching and are fed by both parents. This Grosbeak builds such flimsy nests that eggs are often visible from below through the nest bottom. They are good friends to the farmers, consuming many potato beetles.